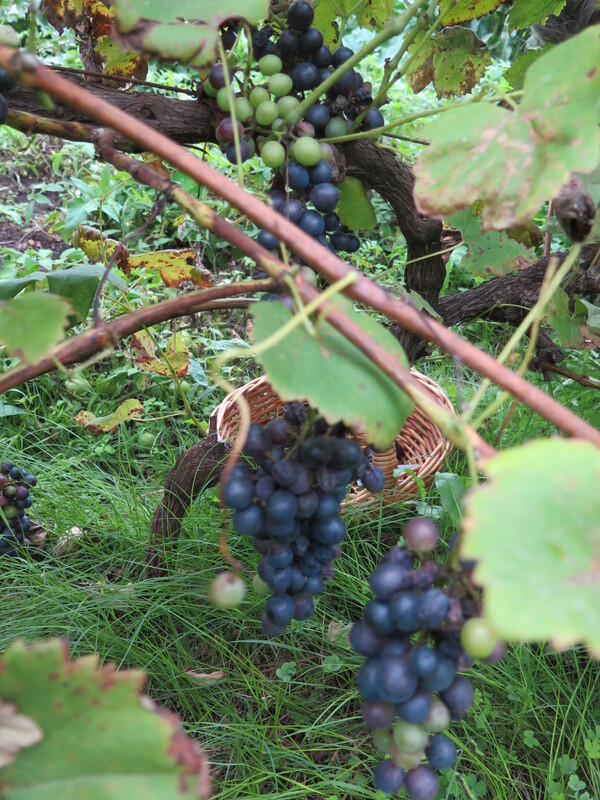 It’s autumn now and the grapes are fully ripe. We have been dealing with them in batches over the last few weeks. Yesterday we made the last pick. The Vendange is over for another year. 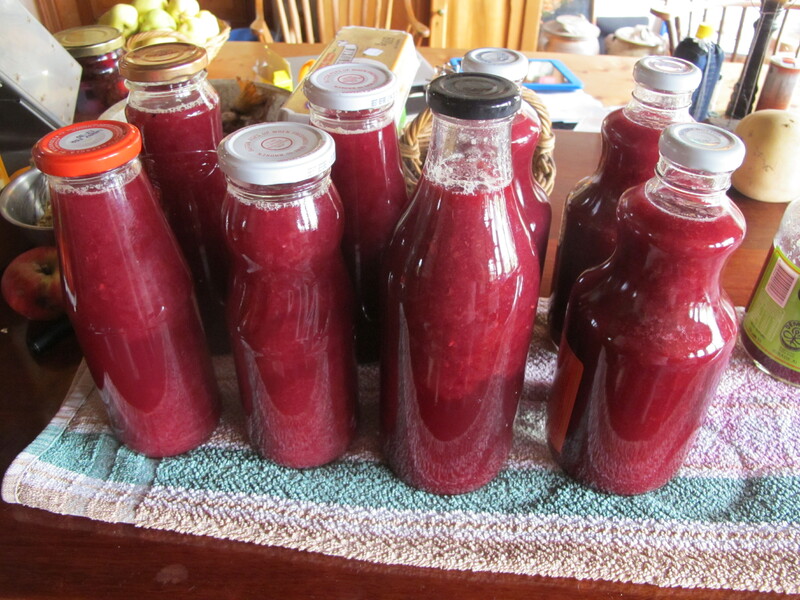 All safely picked, juiced, heat-treated, sterilised and bottled. 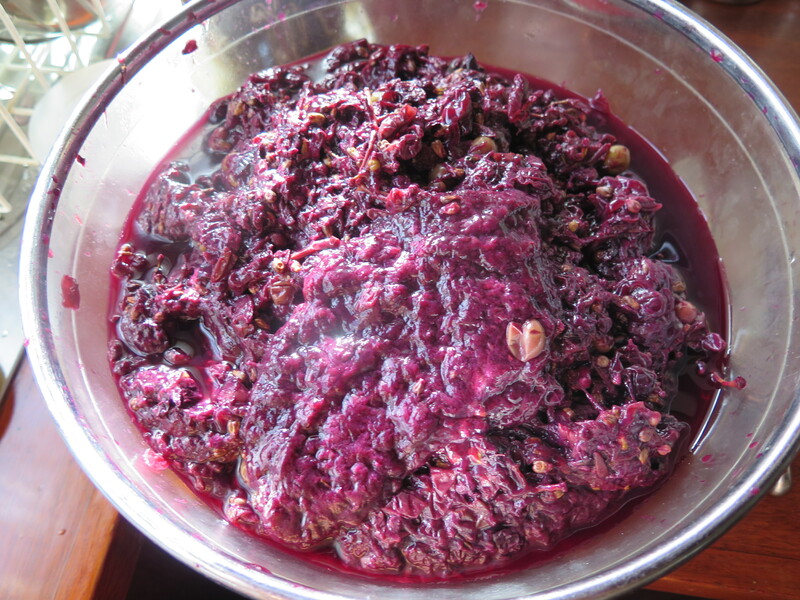 The rich red dark grape juice bottled in this way will keep for 12 months easily. We make it now in the autumn and drink most of it as a refreshing cool drink next summer in 9 months time. 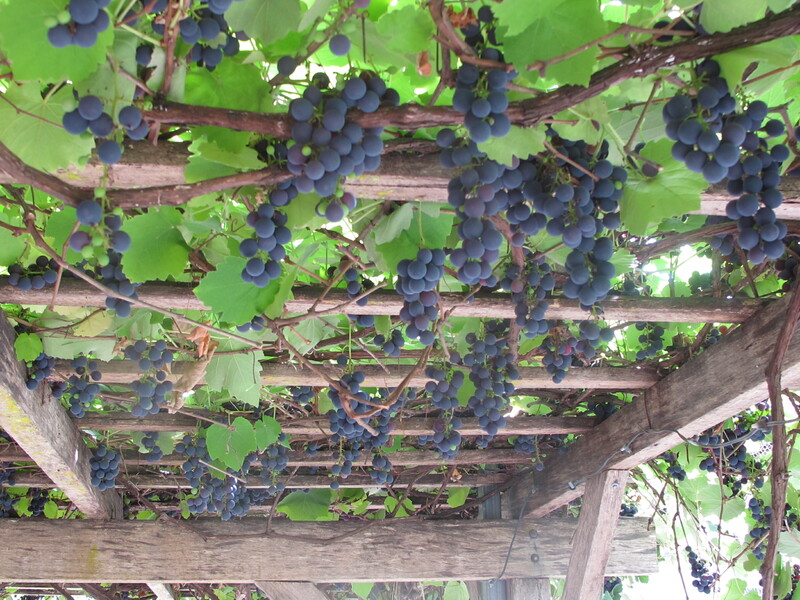 We have preserved dark grape juice from both our shiraz grapes as well as our isabella fragolino varieties. They both make good dark grape juice, but I think that I prefer the slightly foxy, aromatic density of the fragolino juice to the somewhat austere and peppery shiraz. We abandoned making wine from our grapes sometime ago, as it takes a lot of effort for something that is just plain ordinary and we can buy good wine quite cheaply here in Australia. We have learnt to be selective about where we expend our limited energies, so as to get the best return on our efforts. 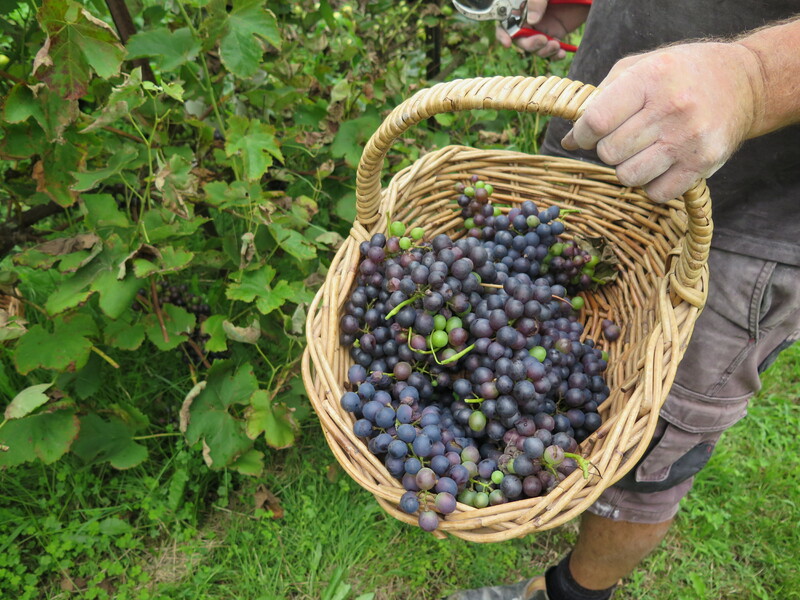 After a lot of experiments, we have learnt that dark grape juice is the best that we can do with what we’ve got, although, this year, early in the season, The Resourceful One also tried her hand at making very early season verjuice. 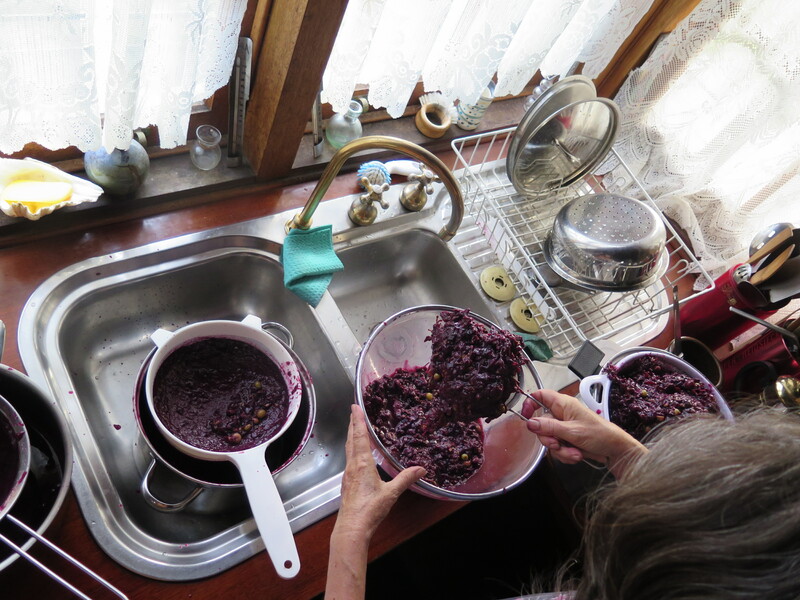 We macerate the grapes and sieve out the fresh unfermented ‘must’, skins and seeds. 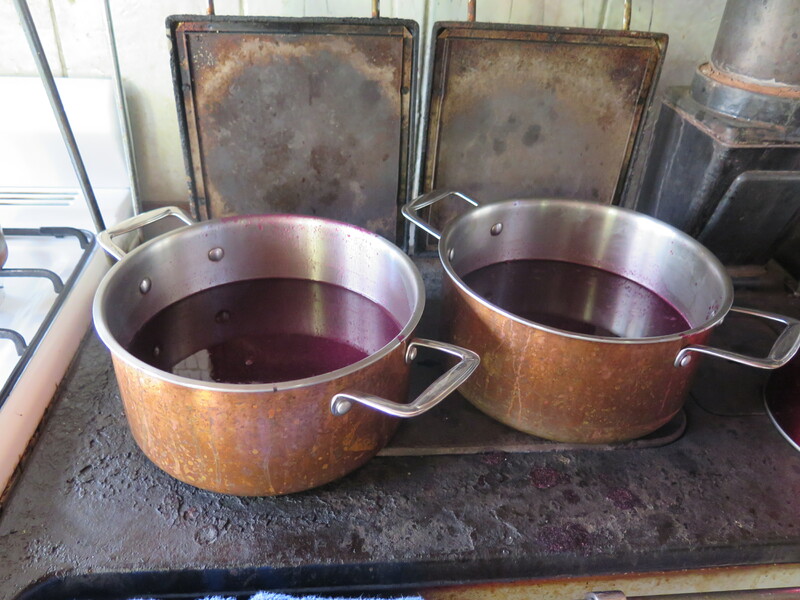 The pure juice is heated on the stove to sterilise it and then bottled into heated jars, fresh from the oven. It all takes time, but this is the quickest and most efficient way that we have found to deal with the harvest, that gives and exceptional quality of product. It also has the added benefit of requiring no energy to store it for a year and keep it beautifully preserved for when you really appreciate it. 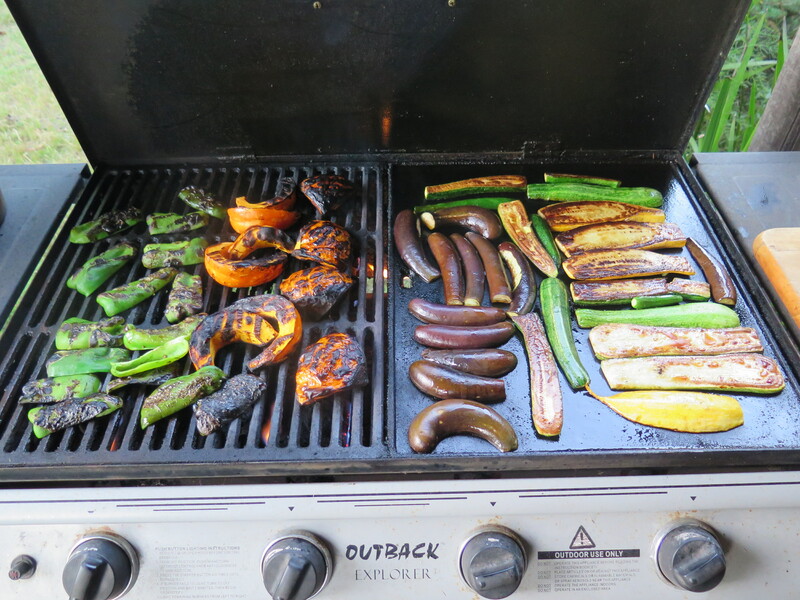 We end the day with a vegetarian BBQ. Nothing special, just quick and simple, place your sliced, freshly picked vegetables on the barbie and turn them when they are softened, Zucchini, aubergines, little golden nugget pumpkin and capsicums. They couldn’t be fresher and cooking outside at this time of year in the evening is a delight. The cooling breeze has arrived and the aromas emanating make my mouth water in anticipation. I make an autumn salsa out of our little, late-season, yellow tomatoes, some garlic and chillis, while the bbq looks after itself. The girls are tête-à-tête, deep in gossip. I plate up to table and we eat them with relish. I like a spoonful of my piquant home-made spicy plum sauce on my bbq’d veggies, but quince paste also works well I think. When we wake, she is gone. Only her tell-tale signature circle work on the front lawn tells the tale of her visit.